Revitalise your spirit and soul, leave the city life behind and escape to the tranquil natural beauty found at RiverBend Lodge. Anchored on endless horizons and flanked by the Zuurberg Mountains, RiverBend Lodge is situated within a 14 000 ha private concession area of the Addo Elephant National Park. Experience the warm hospitality famous to the region as you acclimatize to the comfort of RiverBend Lodge. Enjoy plentiful game activities guided by professional guides who’ll not only enlighten you in Africa’s splendid creatures, but also reveal the fascinating history of this revitalized wilderness. RiverBend – a personal experience, dedicated to conservation and rehabilitation of Africa’s natural world. Unwind, relax and enjoy incredible tranquillity and privacy in our 8 luxurious suites – a haven, worlds away from the madding crowds of modern life. Be pampered to a relaxing back massage in the privacy of your room, or sip a cocktail on your private veranda as the sun sets below the endless horizon. Rest a sleepy head on feather soft comfort and let the sounds of gentle bird song wake you to another glorious day in the Addo Elephant National Park. Dating back to the early 1900’s, Long Hope Villa is a beautifully restored Eastern Cape farmhouse. Situated on a remote location further away from the RiverBend Lodge, the villa offers an exclusive and private safari experience. Original wooden floors and farmhouse doors capture the old-world charm. Three en-suite homely bedrooms, each with walk-in wardrobe and spacious charming bathroom add to the home-away-from-home appeal. Luxuries such as percale linen, soft furnishings and even a Pillow Library ensure a sumptuous stay. Relax in the open-plan lounge, furnished with comfy sofas, Satellite TV and DVD player. Enjoy a cocktail at the bar while your personal chef prepares delicious meals in the interactive kitchen – you may even join in on the preparations if you wish! Outdoors enjoy fabulous barbeques on a cool summer evening, or dine al fresco under the stars on the patio. The garden path leads through the indigenous garden to the private swimming pool, and further along to the Sunset Deck – a wonderful retreat for a lazy afternoon relaxing. Long Hope Villa makes an ideal safari destination for families or small groups. Your private game ranger will ensure you have a truly memorable and personal wildlife experience! The cuisine at RiverBend is the perfect fusion of traditional European food and Pan-African fare. Meals are not restricted to the dining-room and guests are encouraged to make use of one of the verandahs or to arrange a packed picnic to enjoy on a game drive. Candle-lit dinners in the privacy of your suite are arranged for a truly romantic treat. From marveling at the magnificent Elephant herds grazing a short distance from you on your private game drive, tracking the movements of game on foot, learning about the medicinal values of the bush to strolling through the citrus orchards of our adjacent farm, RiverBend offers a diversity of activities to enjoy. All at your own pace and pleasure. RiverBend is situated inside a 14 000 ha private concession area of the Addo Elephant National Park. Home to the Big Five, the region is also steeped in history and along with National Parks, RiverBend is constantly involved in rehabilitating this magnificent wildlife region to its former glory. Game drives are conducted inside the Addo or in our 5000ha Private Intsomi Reserve. The Intsomi Reserve, accessible exclusively by RiverBend, is also home to various species not seen in the Addo such as Giraffe, White Rhino, Gemsbok and the endangered Bontebok to name but a few. Guided walks are conducted in the Intsomi Reserve where your guide will focus on the smaller creatures and plants. Joining one of our professional guides on a night drive, the beauty of the Southern Hemisphere sky and its history will form part of the search for some of the indigenous nocturnal species to be found in the area. Take a picturesque drive into the majestic Zuurberg Mountains. Enjoy a sundowner drink as the sun sets over the sweeping valley below and watch as the colours change the mood of the day. Ideal for those seeking breath-taking beauty and tranquility. The region is home to over 300 species. Search for the ever elusive Narina Trogon or Knysna Touraco in the forests on the mountain slopes, the Blue Cranes nesting in the grassland or the majestic Black Eagle soaring overhead. Our guides are all trained bird watchers and special birding trips can be arranged when making your reservation. Should you wish to spend the day away from the lodge and other non-birders, our guides would take you on a private birding trip with a packed lunch to be enjoyed in the veld(by prior arrangement). Viewing wildlife from horse-back is a truly exceptional experience. Become one with the nature and the resident wildlife as you ride along the beautiful trails through the Addo National Park. Various trails led by experienced guides, are offered for all levels of riders. This is an additional activity, operated by Addo Horse Trails and can be arranged at an additional cost, on request while staying at RiverBend. Learn about the medicinal values of the flora and fauna in the region by an experienced local ranger. Or take a self drive historical tour to the battlefields and frontier town of Grahamstown – a mere 80kms from RiverBend. Spend some time visiting the RiverBend Citrus farm on a guided tour by our citrus manager. The RiverBend Citrus farm currently has over 217 000 trees producing oranges, navels, ruby grapefruit and lemons for the export market. Our chef will prepare a delicious picnic for you to enjoy in the coolness of the orchard shade. Appreciate nature from an elephant’s perspective. Walking besides these gentle giants will allow you to observe the elephant’s habits in their natural surroundings. This Elephant Encounter Excursion is about learning and becoming familiar with one of Africa’s most stately, intelligent mammals – the African Elephant. It is an adventure of relaxed interaction with the three rescued, tame elephants, enjoying the beauty of the area and of getting acquainted with these gentle giants in a meaningful way. Elephant Encounters is an additional activity on offer whilst staying at RiverBend. 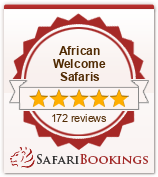 It is operated by Addo Elephant Back Safaris and excursions can be arranged at an additional cost. Big open skies and wide horizons offer spectacular stellar and planet gazing. Our rangers are highly knowledgeable in astronomy and offer interesting talks on night drives. Special astronomy packages can be arranged on request. Peanut butter sandwiches without the crusts? … we’ve got it! Children of all ages are welcome at RiverBend. Various activities are on offer including a playroom where hours of fun can be had. The team is geared towards every need and children will be taken on walks with their guide, baking biscuits with the chef or doing mini treatments with the Beauty Therapist. There is also a dedicated channel on our television network on which children are able to choose from a selection of videos to be played. Should your children decide not to join you on a game drive or for dinner, we have trained child minders to take care of them while you can relax and enjoy the beauty of the Addo Elephant National Park and make use of the luxury facilities at RiverBend Lodge. A specially designed kiddies menu of all-time favorites, served at your convenience, all form part of our commitment to ensuring a pleasant stay for all our guests. Complimentary child-minders are available daily from 8am – 5pm, after hours care can be arranged at an additional cost.